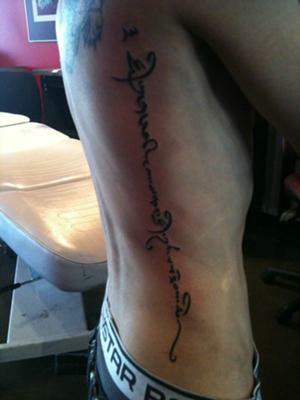 I got two quotes done in Tibetan, one on each side of my Ribs. This one says "What does not kill you will make you stronger"
Gosh I was in so much pain had to take a break after the first one for 20mins but 2nd one was ok. It's so worth the pain I love it. I got it designed in China then got the tattoo done over here in Melbourne Australia. The tattoo artist loved the designed he wanted to keep it up I said I don't want people having the same thing. So I took the design with me. The other one I have is "Learn from yesterday Live for today hope for tomorrow"
Now I'm thinking getting another one but don;t know where and what as yet.